I was very tempted to title this blog post something like 'That's a Wrap!' in the great tradition of American Corniness, but instead I'm going with the straight up title of the pattern: Herbivore. 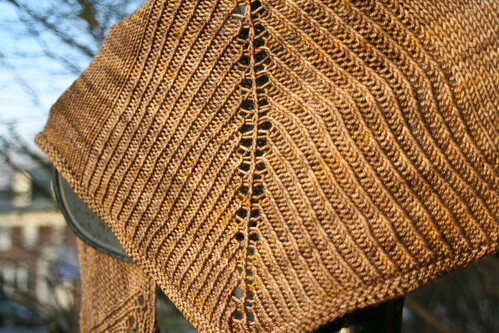 Learn this name because at some point you WILL be knitting this pattern, ok? 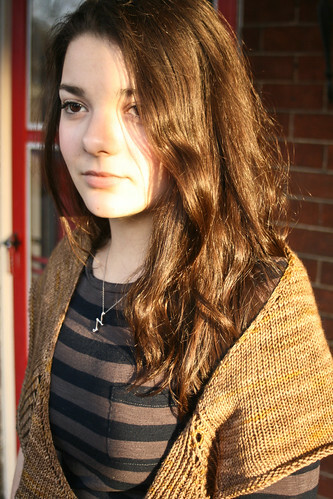 Yarn: The Sanguine Gryphon 'Bugga', 1 skein in 'Charlotte'. Needles: Size 6 Kollage square needles, firm cable because the soft cable ones are dead to me. This is my first time knitting with the Sanguine Gryphon and Oh My GAH is it nice. Ultra-soft and the color is complex like whoa. HELLO are you checking those yellow flecks in the most gorgeous pale brown ever? I mean, who even thought of that? Wow. Now on to the pattern itself. Verdict: the most winningest pattern that ever winned. 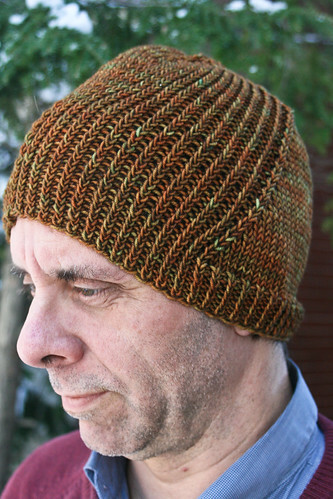 Stephen West loves his twisted stitches, does he not? 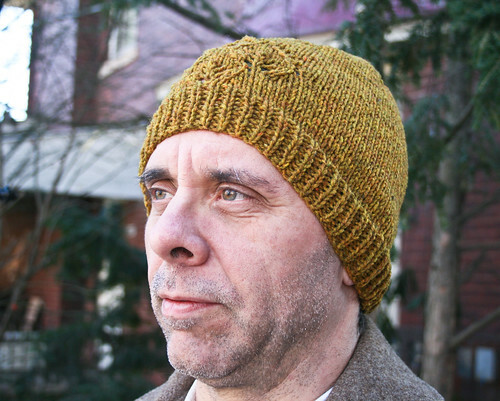 There is a simplicity in the combination of the twisted stitches and the stockinette that is so satisfying both from a visual and knitting standpoint. The shape is unexpected and makes for a truly versatile garment. 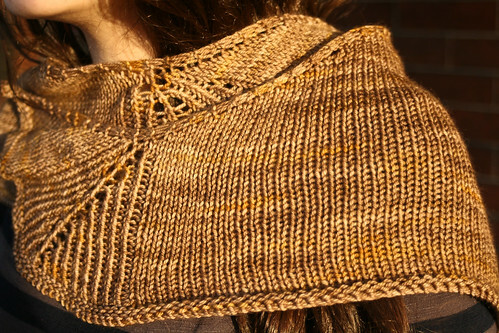 Is it a shawl, a wrap, a scarf, or something else entirely? Size-wise you can absolutely monkey around and get the size you like. I made a medium-ish size and am so happy with the results. I have to say that I was initially prepared to be cheesed-off that there wasn't a chart with this pattern but OMG STEPHEN PLEASE DON'T BE MAD AT ME I WAS WRONG. There is no need for a chart. Pfft--unnecessary. No need whatsoever! After this and Windschief, I am on a complete roll and have decided to cast on for Clockwork because it has fabulous written all over it. I can't stop! And luckily the guy seems to be churning these patterns out like it's his job (oh wait...) so I am set for the next 24-36 months! 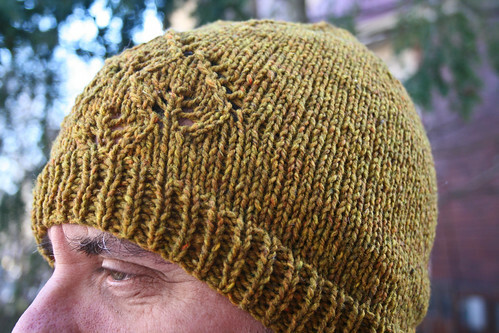 Frankly I don't understand how I could have not blogged about these two hat patterns earlier. Ideally it would have been before the freight train known as Daylight Savings Time flattened me and turned me into the walking wounded. I fail to see how a one hour time shift can make a person feel so utterly ill, but there you have it. So. LAME. Yarn: One skein of Shelter in 'Hayloft'. Mods: None, I did as I was told. Melissa is the queen of the jaunty hat pattern that once you see it for the first time, you are and bound and determined to drop everything and make it immediately! I love this pattern SO MUCH. 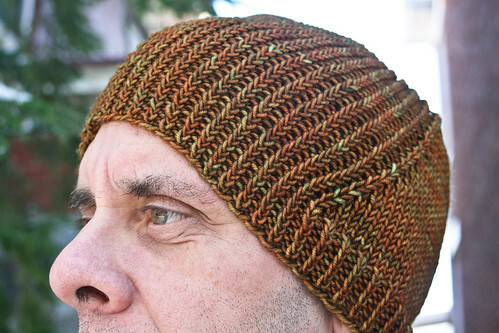 The pattern comes in either a tam or beanie version, and I opted for the latter given that it only needed one skein. Shelter is the perfect yarn for the occasion here. There is a reason this yarn is so hyped at the moment! It is versatile like nobody's business as I have seen many ultra-enticing projects, none more so than Chawne's unbelievable blanket. The intrepid among you who have downloaded this pattern or seen it elsewhere will notice that I knit the hat not only out of the yarn called for but also the exact color featured in the pattern. Yes, I am that person. Hi! And just in case you think I am not aware of the eye brow situation here, I am. I have hectored the person in question mercilessly about it but to no avail. Let us never speak of it again. Mods: I did the crown decreases an inch before the pattern indicated per many recommendations on teh Rav and the hat turned out perfectly. This is a truly clever pattern. 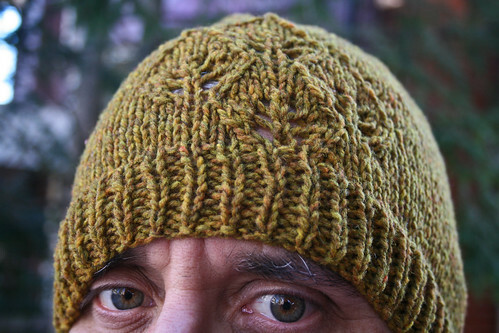 Steven West loves his twisted stitches, that's for sure, and watching them migrate and twist on this hat is quite a lot of fun. Seriously! This hat has turned out to be my gateway drug to other Steven West patterns, as since finishing it I've finished another one and even cast on for a third. Which is to stay WATCH THIS SPACE for more twisted stitches.